Distinguish any living space with the versatile style of this eye-catching oval wall mirror. This oval wall mirror from the Uttermost Pursley Mirror collection features a plated brushed nickel finish for decorative elegance. Crafted with glass and steel, the quality is evident in the design of this fixture no matter where featured. 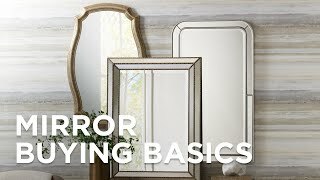 For convenience, this mirror may be installed vertically or horizontally to accommodate the existing layout of any space. 20" wide x 30" high x 2 1/4" deep. Hang weight is 22 lbs. Glass only section is 19 3/4" wide x 29 3/4" high x 1/4" deep. Surrounding frame is 1/2" wide. Oval wall mirror from the Uttermost Pursley Mirror collection. Can be installed vertically or horizontally. Three-hole D-ring hangers. Plated brushed nickel finish. Steel and MDF wood construction. Hang this frameless oval mirror from the ceiling with its included mounting kit and hardware in dark oil rubbed bronze finish. The classic ambiance of industrial times reflects in this large frameless oval wall mirror with square black metal brackets. With a warm gold finishthis oval wall mirror lends rich depth and classic charm to a bedroom or dining area.